Single gas on the main, definitely. Keep in mind that a simple gas steal vs a Protoss basically forces a 4-gate. Starting off with 1 gas would give T and Z a HUUUGE advantage over P. It works if there's 1 gas at the natural or any later expansions, though. Hah, I knew there was a way. Didn't know it was that easy, though, lol. Thanks for the tip ;). The videos are not made solely for the purpose of tips and tricks, when it comes to melee mapping, it is more of an introduction, but contains quite a few pointers on what sizes of fx main and expansion, placement of xel'naga watchers, map mirroring and other minor tips and tricks to balancing etc. I was asked to make some videos like this for a couple of weeks ago, but never got around to post them, and from what I can see, this is where they are suppose to be posted. The Seven Dwarfs were sitting in a tub feeling happy. So Happy got up and left. Not sure where you're from Victiln, but you've got a genius accent/voice. You remind me of Sherlock Holmes =P. Have to say thanks, Not everyday I get a compliment for the accent lol. To this discussion I'd like to add some of my own melee map making philosophy. When you make a map try to balance it out when it comes to open areas versus cliffs. If you put a lot of cliffs then the map can be abused a lot by certain strategies or races, terrans most notably with siege tanks, it can also force excessive air responses. If the map is too open then other strategies can be abused, Zerg become super strong because of the lack of chokes and their potential to swarm their enemies to death. Balance the map, if you make a certain area too open compensate by making other areas closed. I'm a big fan of having different types of areas on a map so that all races can be equally viable. So I know that melee mapping might not be the most interesting for a lot of us "custom mappers", but I would like to try and revive this thread. Melee mapping in general lacks organization, and it revolves a bit too much around copying Blizzard maps, at least in my opinion. So, I believe it is time for a THREAD NECRO! Anyways, I would like to TRY and revive this thread, and see what we can do with it as a community! Any ideas you have I will add to the OP thread, and then see where that takes us. If no ideas come in... well then I guess we will have no tips and tricks :( Let's not let that happen! NOTE: Try and include numbers. For example, x minerals per expansion, map about x size for, number of vespene geysers x, etc. Try to stay away from the "do what feels right" advice when dealing with things that revolve around numbers, BUT if you have some advice that DOESN'T deal with numbers, PLEASE share that as well. For some ideas on what I mean by that, check out the notes section of the OP. Glad to here it! I hope others do to. The community needs to run this. I did some research and added some tips to the OP, but there is much more that needs to be done. If anyone wants to extract any details that might be useful from those YouTube videos and share them in text format, it would be much appreciated. 3/ i don't give a fig about pro players nor do i agree that their opinion is anything but self serving (totally legit on their part) and bad for everything that goes with "melee entertainment value"
I want to share some of my thoughts on expansions and how there need to be variation in the game. 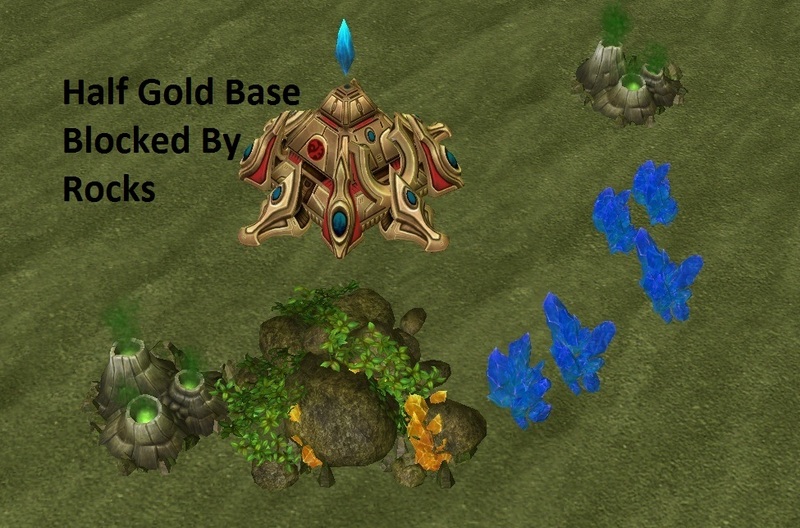 Currently there is one variation called the gold base that is usually in the center of the map and sometimes there are rocks preventing you from building your Nexus there. One of the fact about a gold base is that the gold minerals nods deplete faster then regular blue mineral nods. 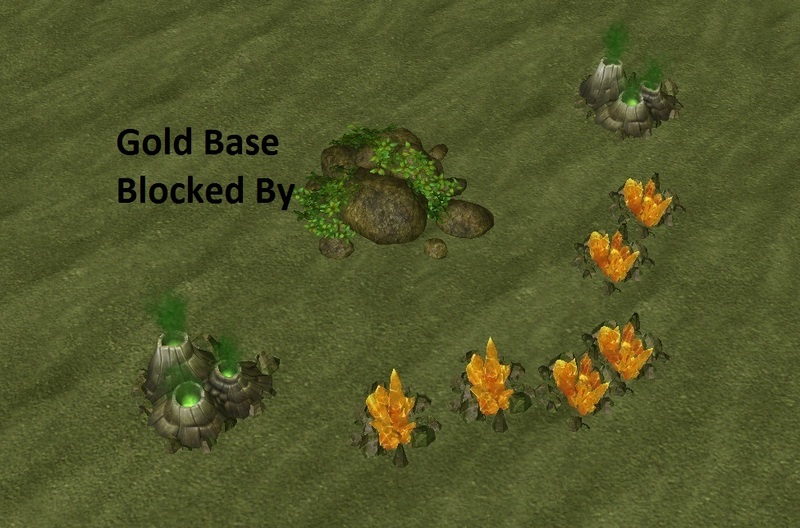 The first fantasy expansion base is a half gold base where the rocks cover the gold mineral nods. You can build your Nexus at the optimal mining distance from the minerals nods but as for the Gold minerals, You will still be able to mine from some of the gold minerals that are in the rock pile but the mining path will not be optimal. Also there is some gold mineral nod in the center of the rock pile that is untouchable so until you can remove the rock pile you wont get to them. The second idea is to to have a Rich Vespene Geyser base where the rich geysers are covered by rocks. 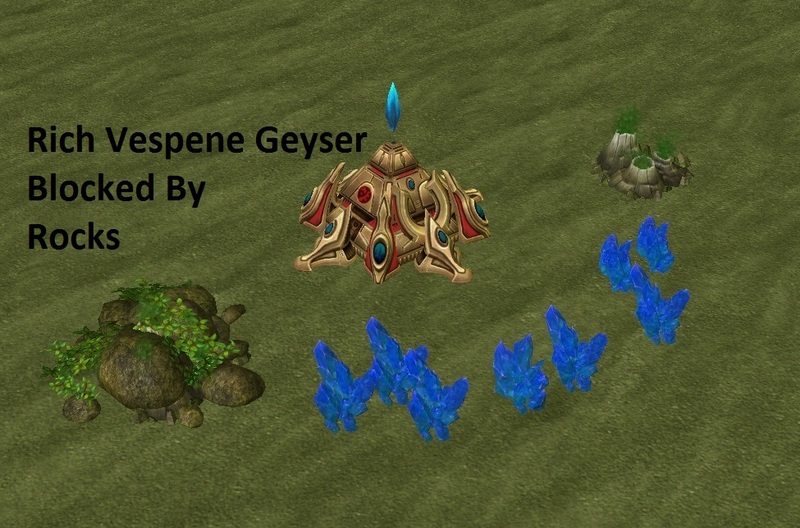 Again you will be able to build you Nexus at the optimal mining distance from the resource nods but you will haft to remove the rock pile to get the Assimilator on the geyser to start harvesting your rich vespene gas. Having variation in the expansion base will bring new light and understanding in how the game can be played and direct certain paths that the player could go down just by the way the map is made and where the key bases are to have are at. This is easy to understand when you see the Force Field at the ramp is follows the same characteristic design pattern. This Setup needs a ramp for it to be use to its full potential same can be said about a base setup that will allow Carriers to be effective unit to have in the army.